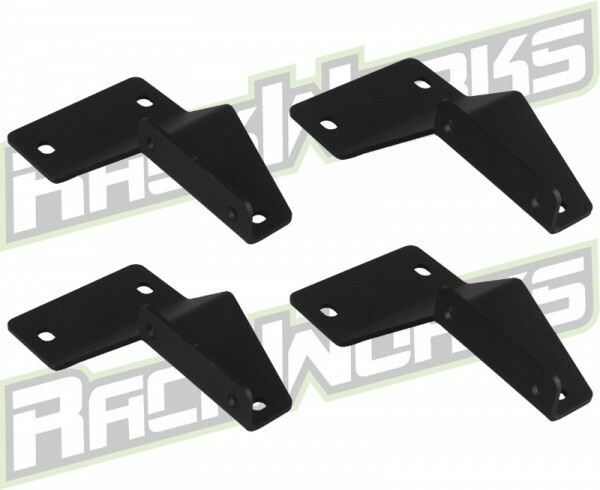 Universal roof track mounts. For use on vehicle, camper shells, or hardtops equipped with flat roof track systems. Mounts work by bolting to our crossbars and attaching to top of the roof tracks. Mounts slide on cross bars to adjust width to match roof tracks. Work well on flat mounting surfaces. Also can be used on through bolt surfaces with access to under-side. Sold in set of (4). Hardware included. • Track or through bolt mounting. • Laser cut and formed. • Made from 11ga steel for maximum strength. • Fine texture black powder coat. • High quality stainless and zinc hardware, included Riv-Nuts for mounting surface. • Maximum Mounting width 48 ½“ Center to center. • Compatible with Mid and Full size vehicles. • Fits All aftermarket camper shell brands with or without factory roof tracks. ARE, Snug Top, LEER, CENTURY, and any other brands. • May need roof track insert hardware for mounting, contact dealer. • Should be installed by qualified installation facility or individual with high level of mechanical experience. • Determine mounting location with rack completely assembled to insure quality fitment and clearance of any factory components (antenna’s, cab lights, or GPS modules) before drilling any holes. • Do not exceed the weight limit of your vehicle’s Factory Bare roof, Roof Rail, Roof Track or Crossbars.